After breakfast (thanks, Nick), hitched a ride with Adam and him back to Soho Sushi to retrieve the trike. From there, headed down to the riverfront in search of the “Purple People Bridge.” Once used by cars, this bridge spanning the Ohio River between Cincinnati, OH and Newport, KY is now dedicated to pedestrians and bikes. Mike Asad, who I met in a Bellevue, KY parking lot, had some strong thoughts to share on coal burning and renewable energy. A little further down the Kentucky side of the Ohio River, spied a barge transporting coal down the Ohio River. Then came upon the entrance to the St. Anne Convent and felt inspired to roll up the driveway to say hello. Was warmly received at the door by Sisters Mary Belle Borros and Mary Bertha Berling. I was then invited inside to meet all the Sisters of the Congregation of Divine Providence, who told me all about the new geothermal system they had recently installed, before treating me to a wonderful home-cooked meal. I learned that they also grow a lot of their own produce on the grounds. Before leaving, Sister Mary Luke Murphy gifted me with their prayers (and stocked me up with almost more food than I could carry). 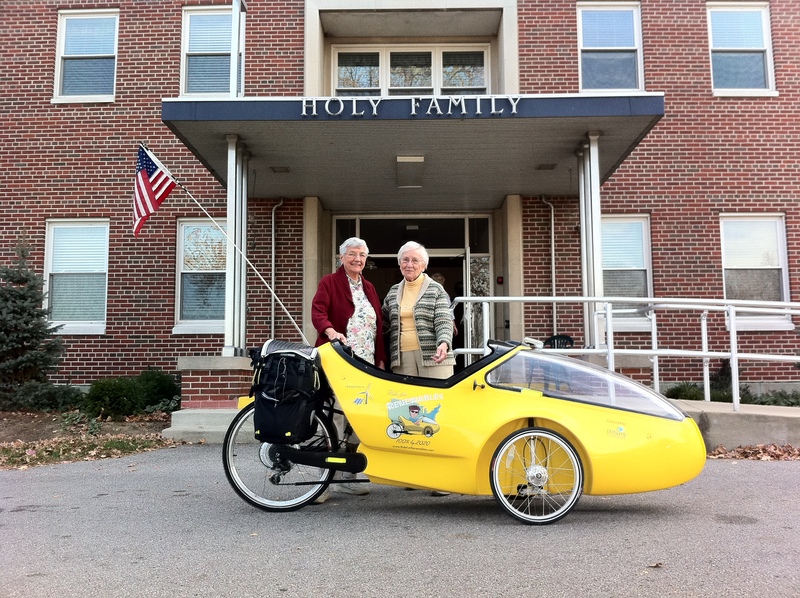 Bless you, Sisters of Divine Providence! Although it looked good on a map, Hwy. 8 had no shoulder and was full of potholes, making for some hazardous riding. On top of that, the bike chain started acting up again in the late afternoon, so hedged my bets and made for a truck stop after 32 miles. Just glad I took the detour along the way and didn’t try riding through the new pavement. One of the workers told me some bikers who did try it ended up with flat tires and hot tar coating their bikes. Don’t know how far I’ll get tomorrow with this recurring chain issue, but not much I can do about it tonight. Got permission from the truck stop owner (thanks to Anna and Barbara) to pitch my tent near the idling trucks (that’s what earplugs are for) in the back. Set up shop inside where it was warm until they closed (11pm) then hit the sack. As luck would have it, this little, rural truck stop served Empress Chili. This entry was posted in 2010 Ride, Blog, Video and tagged cincinnati, coal barge, congregation of divine providence, geothermal, ohio river, ride for renewables, soho sushi, st. anne convent. Bookmark the permalink.